This week has been taken up with lots of kitchen research. The paperwork has been signed, and the first payment made, to start our full kitchen remodel. I need to have spec sheets to give to the designer within a week, so appliances must all be decided pronto. Luckily, I have a few extra bird journal pages stashed for just such overwhelming times. 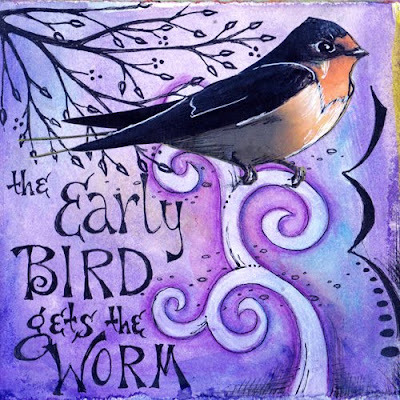 Doesn't "the early bird gets the worm" seem completely relevant? The real hindrance to a quick remodel will probably be me, if I wind up dragging out decisions. I believe I have the cooktop, ovens and refrigerator finally selected. Granite is settled (if I can actually get slabs of my someone rare choice) and marble is either/or. Layout is the issue I'm most concerned about now. And the barn swallow you have here is always one of our early birds in terms of building a nest. We have "mud" down our windows as I type, courtesy of these early birds! Love this page - and good luck with all those decisions! This is such a gorgeous bird! Love your drawings my friend! !